Join us in the galleries for a thirty minute conversation with Noel Smith, Deputy Director and Curator of Latin American and Caribbean Art at the Contemporary Art Museum, University of South Florida. A brief overview of the exhibition Oswaldo Vigas: Transformations will focus on the artist’s wide-ranging artistic investigation and production. Vigas’s adoption of indigenous Venezuelan subjects is framed by his experience of European modernism, earning him a place among Latin American artists who established unique voices in the international canon. Noel Smith is Deputy Director/Curator of Latin American and Caribbean Art for the USF Institute for Research in Art: Contemporary Art Museum, Graphicstudio and Public Art. Her primary area of research is contemporary Cuban art, and she has curated exhibitions of the work of Los Carpinteros, Carlos Garaicoa, Celia y Yunior, Glexis Novoa, Tonel and Javier Castro, among others. She has translated literary and critical texts for authors and institutions including Tonel, Orlando Hernández, Corina Matalmoros, CIFO, Daros Foundation, and the Museo Nacional de Bellas Artes, La Habana. Thirty on Thursday gallery talks are free with regular admission. Questions? Email the Education Department. Image: Oswaldo Vigas (Venezuelan, 1923-2014). 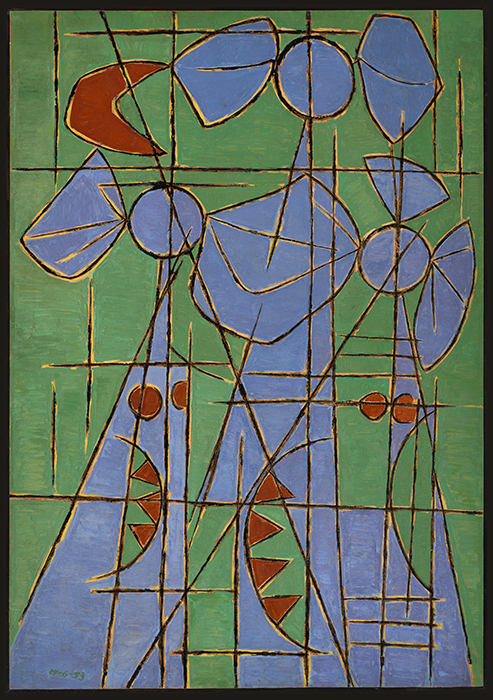 Proyecto para mural en verde (Project for Mural in Green), 1953. Oil on paper glued on Masonite. 42 ½ x 29 ½ inches. Courtesy of the Oswaldo Vigas Foundation.